What goes on behind the scenes in digital strategy is intricate and complex. 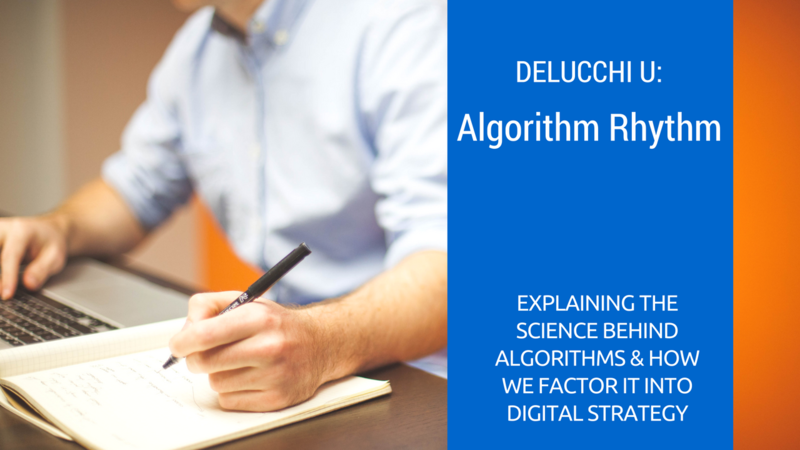 At today’s Delucchi University, we got the inside scoop on algorithms from our Senior Search Marketing Analyst, Eric Jessell, who works with algorithms on a daily basis to create the best digital strategies for our clients. To define them simply, algorithms are computer programs that look for clues to give you what you want, and also to solve problems. Algorithms incorporate a myriad of factors, but they’re almost always used to improve processes. Eric filled us in on how Google, Twitter, Facebook and Instagram incorporate algorithms, and how each company has a different goal that one must consider. Eric regularly analyzes these various platforms (and how they use algorithms) to help put together nuanced and intuitive digital strategies for our clients at Delucchi Plus. From SEO strategy to paid search campaigns, Eric incorporates his knowledge on algorithms to drive greater brand awareness and create a robust digital presence. This Delucchi U not only took us backstage on digital strategy, but also taught us that not all users behave the same, nor do we know everything about how these algorithms function. Eric’s detailed observation of algorithms showed us his innate ability to keep up with and adapt to all kinds of digital processes.